In my book, that is a 4 letter word. I got some insight from God while at Passion2012, and I'm so grateful. Fear was keeping me from being able to make decisions. And from growing and moving forward in several areas. Don't confuse fear with being careful. Careful is good, it keeps up from wasting valuable resources and discouraging people who follow us. Careful can be used as an excuse to do what we should, but carelessness is not good, and people won't follow you if you are flippant and careless. You don't overcome fear by waiting for the feeling of fear to go away. It's by taking courage and doing the thing you fear. 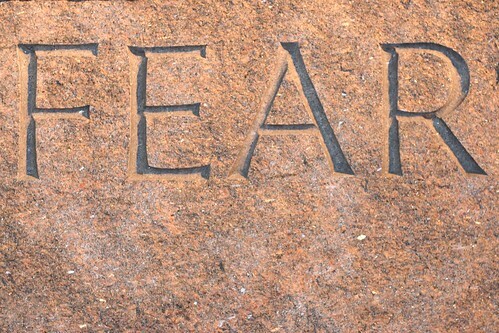 Fear looks so imposing, an obstacle that cannot be overcome. When you see it in real proportion, however, things change. The Truth is that, if Jesus Is Alive, then my fears aren't the rulers of the universe. I get the courage to do the things I fear by seeing God, in His real size, Lord of All, Lover of my soul, and acting on what I know is true, rather than obeying the voice of fear says such deceptive, depressing, small-living things to me. Thanks to God that Jesus has overcome the World! Fear is no longer in charge.